Fashion Show luncheon, an amazing Quilt Exhibit, a raffle for a Baker O’Brien Art Glass Horse, and Project Silver Shoe & Silent Auction. Downtown Bowling Green and the Bowling Green Arts Council have put together a walking gallery of over 30 local artists. 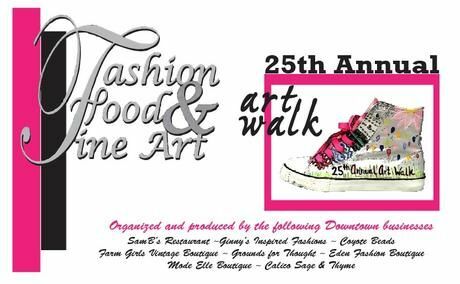 You can pick up a brochure at the participating businesses or simply stroll our Downtown and look for the Gallery Signs. We are also pleased to present a Fashion Show luncheon, an amazing Quilt Exhibit, a raffle for a Baker O’Brien Art Glass Horse, and Project Silver Shoe & Silent Auction. It’s a full day of all the arts and plenty of WALKING! Click here to re-send your order confirmation or PDF raffle tickets.